If you can't use the traditional fridge for a board, try a cookie sheet. Help your child make her name, family names, and friends' names. Sort consanants from vowels; uppercase from lowercase; by colors. Make food words (corn, peas, apple, milk), then have your child draw a picture of that food. Cut out pictures from a magazine; make the words next to the the picture. Build word families: start with "at"...then create "sat", "mat", "hat", "cat". Place the letters in alphabetical order, then in backwards order. 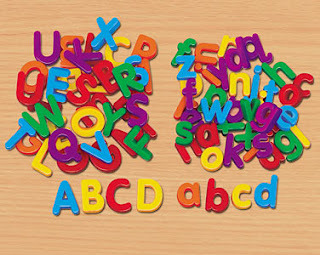 Choose a letter, then ask you child to find the one that follows (in the alphabet). Make sentences: start with "I am..." or "I love...", then have your child fill in the blank. Create words, then have your child write those words on paper. Join Our Facebook Group to discuss and share your own ideas.